Successfully Added HK Warehouse Elephone P8 Android Phone - Android 7.0, FHD Display, Helio P25 CPU, 6GB RAM, 4G, Dual-IMEI, 21MP Camera (Red) to your Shopping Cart. For all smartphone photography lovers out there, the Elephone P8 will be the ultimate Android phone. At the rear, this sleek Android smartphone packs a stunning 21MP Dual-Lens camera. This beauty lets you shoot breathtaking images as well as Ultra-HD 4K video. With this camera phone in your pocket, you’ll be able to take pictures and record videos like never before. It even comes with a 16MP front snapper. Thanks to this, you can shoot the perfect selfies with all your friends and loved ones or engage in sharp video calls at any time of the day. The Elephone P8 makes sure that not a single memory will ever again pass by uncaptured. Naturally, this flagship smartphone has so much more to offer. It comes with a beautiful 5.5-Inch Full-HD display on which it treats you to 1080p visuals. Underneath this screen, you can find the phone’s Helio P25 processor. This Octa-Core CPU has been clocked at 1.7GHz due to which it treats you to a powerful performance. Together with the phone’s 6GB RAM and 64GB ROM, it is capable of tackling all the latest software features out there. Whether you like to play games, watch movies, or browse the web – this latest Android phone handles it all. With its Android 7.0 operating system, your cell phone treats you to a smooth experience while enjoying all the Apps and media of your liking. For extra connectivity, you can enjoy the phone’s Dual-IMEI numbers and 4G. This means that you can always stay connected to two network providers at the same time. No matter where your next adventure will take you, with this Android phone you’ll always stay connected to friends and family. 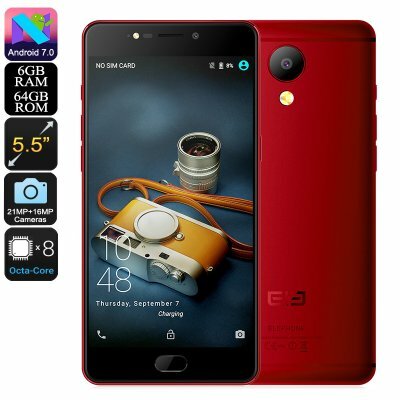 The Elephone P8 smartphone comes with a 12 months warranty, brought to you by the leader in electronic devices as well as wholesale Android phones..